One of the highlights of Lightning Returns: Final Fantasy XIII is all the costumes you can play around with. Aside from the costumes included in the game and the DLC costumes, Square Enix also has a limited Aerith from Final Fantasy VII costume and weapons. Well, it was supposed to be limited. The Aerith costume and weapon set was a limited offer only for people who had purchased the official Japanese game guide. 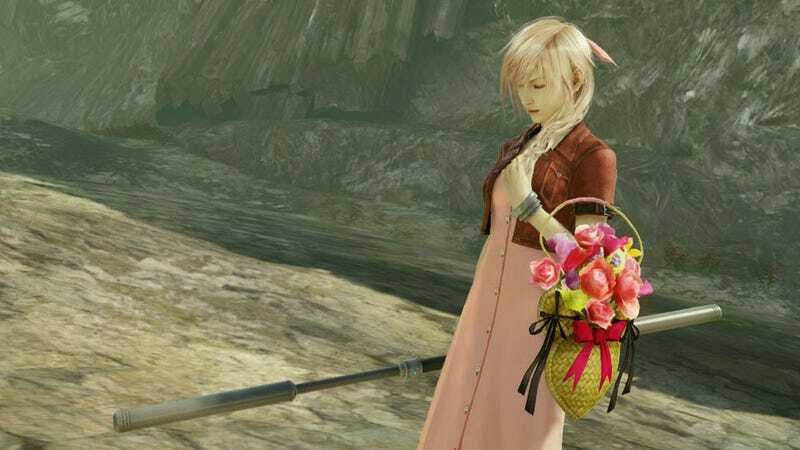 Purchasing the guide got you a redeemable code for the flower selling heroine from Midgar. Unfortunately, it looks like someone forgot to tell someone else that the Aerith costume was a "limited" deal. The costume was made readily available to everyone in the second DLC pack that was released on December 17th. The costume pack was taken down shortly after on December 20th, with an apology on twitter from the Lightning Returns staff. While PS3 users who had purchased the DLC pack can re-download the costume from their download list if they had deleted the data, it looks like owners of the Xbox 360 version are out of luck for the time being. Earlier today, an explanation and apology was posted on the Lightning Returns official site and twitter acknowledging that the Aerith costume was supposed to be only available for people who had purchased the official guide and that due to a mixup it was offered as purchasable DLC. The staff extended apologizes to both the guide publisher and other staff involved as well as all the customers affected. The other costumes in the DLC pack – the Cloud from Final Fantasy VII and Yuna from Final Fantasy X-2 costumes – have since been put back up online as individual DLC (each priced at ￥400 (US$3.82)). Lightning Returns: Final Fantasy XIII is scheduled for release in North America on February 11, 2014 and Europe on February 14th, 2014. It is unclear whether the Aerith costume will be made available at any time in the future for these areas or not.